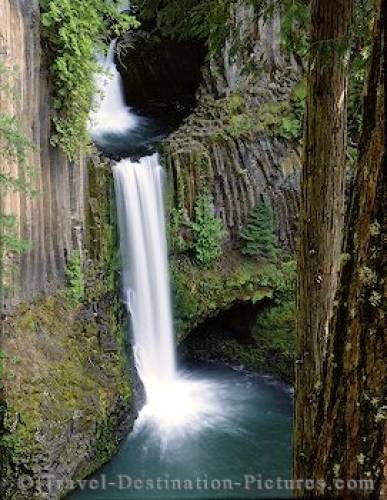 The stuning Toketee Falls are created from just one channel of the Umpqua River which flows through the Umpqua National Forest in Oregon, USA. This channel of the river is said to plunge 120 feet in two giant steps to the pristine pool below over a volcanic basalt cliff, after it has been squeezed through a narrow gorge above the falls. Toketee Falls, Umpqua National Forest, Oregon, USA. Umpqua National Forest, Oregon, USA.